Almost 50 years ago, the US Navy taught me about DC motors: how too much current can demagnetize a motor, about keeper bars if an armature must be removed, and a lot more. I know this is also true for stepper motors according to present-day manufacturers literature. For 45 years, I've never used this information, but now I have some N-scale DC motors that need to be remagnetized. Have you or will you consider a short treatise on this subject? The term "permanent" magnet is somewhat misleading, in that heat, vibration, and reverse "EMF" can weaken its magnetic field over time. For a motor to develop full torque, it is necessary for the magnets to be saturated, or fully charged. No matter how a magnet's strength is lost, it's just a matter of time before you'll be forced to fix the problem or replace the motor. The fix, as you point out, is to remagnetize the motor. This is typically done by placing the motor sideways, positioning the magnet between two very strong electromagnetic poles, as shown below. 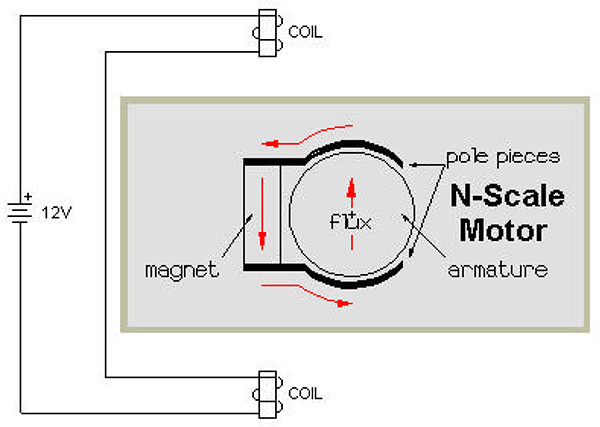 The most common DC motor of this kind is called the side magnet, open-frame motor, also shown. Servo and stepper motors, too, suffer the same malady. However, the fix here isn't so easy because of magnet alignment. When refurbishing one of these devices, I suggest sending it to a "tune-up" shop, like those listed below.